Defend Gotham City against villains before the ultimate showdown. 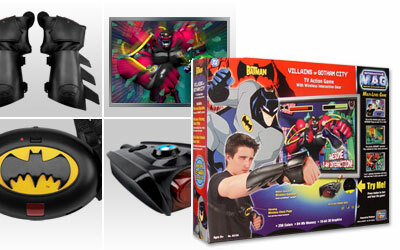 You control Batman's actions with wireless motion-sensitive gauntlets. Punch and Batman punches on the TV screen. Block hits and land kicks. Two-way interaction. Feel and hear instant feedback on the vibrating chest plate. No console or software required. Unit connects directly to your TV with multi-level game play. 3D graphics with 64Mb and 256 colors. Set includes chest plate and game unit with television AV input cable.